Jim Kielbaso is the President & CEO of the IYCA, and is also the Director of the Total Performance Training Center in Wixom, Michigan. He went to Michigan State University for a BS in Exercise Science and received his MS in Kinesiology from the University of Michigan. 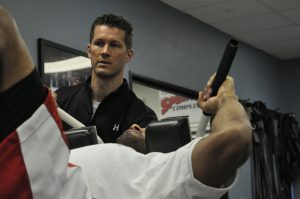 He got his NSCA-CSCS in 1995, and did the NASM Certified Personal Fitness Trainer certification in 1993. Jim was the Head Strength & Conditioning Coach at the University of Detroit Mercy from 1996-2002 and earned the distinction of NSCA Strength & Conditioning Professional of the Year for the Midwestern Collegiate Conference (now the Horizon League) in 1998. He was also an adjunct faculty member at UDM, teaching several courses in the Department of Sports Medicine. He served as the State Director for the National Strength & Conditioning Association for six years, and Regional Coordinator for four years. Jim Kielbaso has written three books, produced multiple training videos and authored numerous articles. He has been a featured presenter at clinics, camps, and conferences across the country including the NSCA National Convention, NSCA Personal Trainers Conference, Michigan State University Strength & Conditioning Clinic, Complete Speed & Power Summits, IYCA National Summits and many more. Jim’s book Ultimate Speed & Agility is considered by many to be the most practical speed mechanics and programming book on the market. Jim co-authored the Certified Speed and Agility Specialist certification curriculum for the IYCA as well as the Ultimate Speed Mechanics and Ultimate Speed Drills products. Jim also serves as a sports training business consultant to business owners who want to maximize the profitability of their sports training businesses. Jim has worked with thousands of athletes at all levels of competition (youth, high school, national level, collegiate, Olympic, NFL, NBA, MLB and NHL). He has also been hired as a consultant for many teams and schools including the 2012 NCAA Champions University of Kentucky Men’s Basketball Team, the University of Michigan Football Program (combine training) and Saginaw Valley State University football and basketball. Jim lives in Plymouth, MI with his wife, Elaina, and three boys Cameron, Drew and Jack.